Octovien de Saint-Gelais, Epistres d’Ovide, Octovien de Saint-Gelais or François Robertet, three French poems. Manuscript on vellum, made for Anne of Brittany, illuminated by the Master of the Chronique scandaleuse. 265 x 190 mm. 59 leaves, with 8 full-page compositions, some with pictorial borders. This stunningly beautiful manuscript was made for Anne of Brittany, Queen of France. The compilation includes French translations of Ovid's epistolary poems and three French poems that were written for a highly exclusive audience. 265 x 190 mm. – 59 leaves. With 8 full-page compositions, some with pictorial borders. 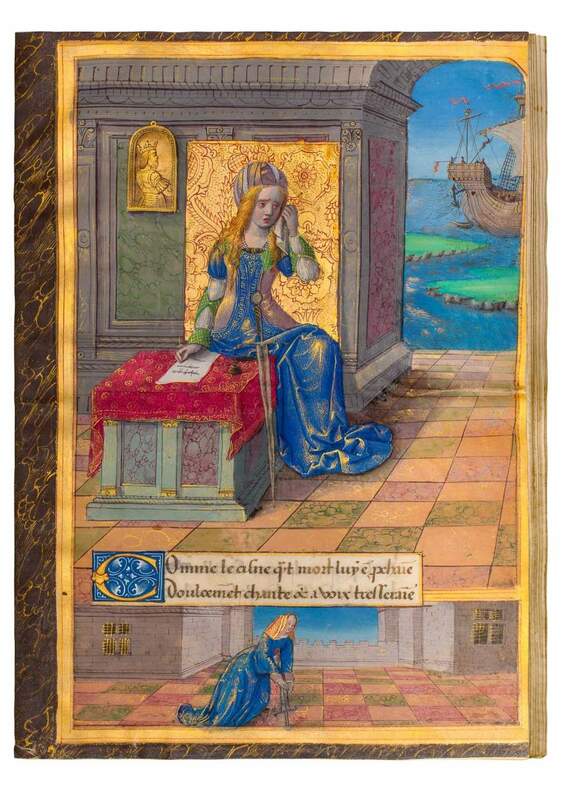 This singular and extremely rare compilation of five of Ovid’s Heroides, in French translation by Octovien de Saint-Gelais, was made for Anne of Brittany, queen consort of France. The letters by abandoned women to their faithless lovers, including the stories of Ariadne, Dido, and Oenone, are part of Ovid’s early work. The subject matter, the heroines of antiquity telling events from their – female – perspective, might have encouraged Saint-Gelais to offer these translations to the Queen, whose own life was just as dramatically at the mercy of men as Ovid’s female letter-writers. Heiress of Brittany, Anne was forced to marry Charles VIII and to agree that, if widowed, she would remarry only his successor. The Ovid translations are bound in one volume, together with three French poems that were presumably written for an exclusive audience, possibly explaining the extreme rarity of this compilation. The manuscript includes eight full-page compositions with outstanding illumination by the Master of the Chronique scandaleuse. One of the full-page miniatures shows Anne of Brittany herself, portrayed with her identified court ladies. Read more about this manuscript in our series of blog posts. See also the Life of Saint Radegund, which was made for Anne of Brittany and her husband, King Charles VIII.